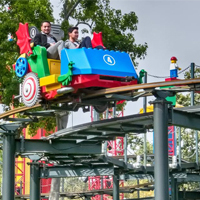 LEGOLAND California is a 128-acre theme park featuring more than 60 interactive attractions, shows, and rides, some are even "kid powered," all geared toward families with children two to 12 years old. The adjacent LEGOLAND Water Park has seven slides and a lazy river where you can build your own LEGO themed raft, while at SEA LIFE™ Aquarium, guests can view undersea creatures like sea stars, sharks and stingrays! At our world-famous Zoo, you’ll discover more than 3,500 animals of more than 650 rare and exotic species in a beautiful 100-acre tropical garden. Spectacular bioclimatic exhibits like Monkey Trails, Lost Forest, Elephant Odyssey, Gorilla Tropics, Sun Bear Forest, and Tiger River house endangered species in enclosures that mimic their natural habitats. The San Diego Zoo is also proud to have the largest population of Giant Pandas in the U.S., one of only four facilities in the nation to house this critically endangered and lovable species. 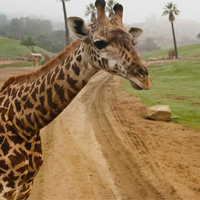 Formerly known as the Wild Animal Park, the San Diego Zoo Safari Park is an extraordinary experience—an up-close chance to experience wild nature at its best. Throughout the 1,800-acre preserve animals from Africa and Asia roam freely over vast expanses of land as they would in their native habitats. Take the Africa Tram Safari for an exciting expedition and guided tour of rhinos, giraffes, antelope, gazelles, and more. Located in San Diego's north inland region, just 30 miles northeast of downtown, it’s an easy drive to the sprawling park in pretty San Pasqual Valley. Wear comfortable walking shoes and plan on a full day of exploration, so you can watch a cheetah run at full speed; come face to face with an African lion; or gaze up at majestic eagles, noble owls, and rare Andean condors. There’s more magic to be found at SeaWorld San Diego, located in glistening Mission Bay. At this 189-acre park you’ll discover spectacular shows, heart thumping rides and dozens of exhibits containing marine life from around the globe. Lifetime memories are created during the behind-the-scenes, private interactions with dolphins, whales, and penguins. 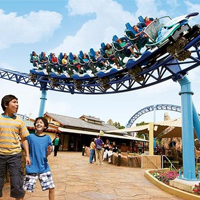 Thrill-seekers love the 60-foot wet plunge on Journey to Atlantis or the ultimate rush on Manta®, the roller coaster shaped like a giant manta ray that reaches its max speed in only two seconds. Follow that with a breathless helicopter simulator ride through the perilous, icy landscapes of the Arctic Circle, or a deep “dive” into the world of sea turtles at Turtle Reef. This 280,000-gallon aquarium is home to 60 threatened sea turtles, an interactive game that teaches kids about the threats turtles face in the wild, a map that tracks rehabilitated turtles, and an exciting ride called Riptide Rescue. 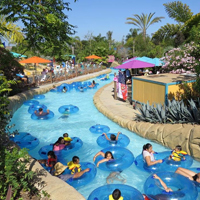 SeaWorld's water park, Aquatica San Diego combines up-close animal experiences, running waters from serene to extreme, high-speed thrills of water slides, and a sandy beach setting into a one-of-a-kind water park. Lounge lazily in a river or scream at the top of your lungs as you plunge down a thrilling water slide. Escape the summer’s heat at this raging water park that’s a splash-filled day of water fun for all ages. 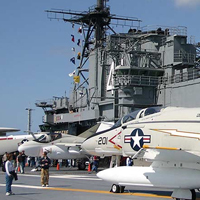 Docked along the Embarcadero, the USS Midway Museum is San Diego’s maritime treasure. It is the longest-serving U.S. Navy aircraft carrier of the 20th century. Relive nearly 59 years of world history as you explore the massive engine room, sleep quarters, galley, brig, and more with a guided audio tour. The four-acre flight deck has more than 20 aircraft—kids, big and small, enjoy the climb-aboard cockpits and flight simulators. Families should request the child's audio guide tour with content geared specifically for 7-12 year olds. Arrive at the San Diego Zoo when it opens at 9:00 AM, so you’ll have plenty of time to explore. With approximately 4,000 animals on more than 100 lushly-planted acres, the best way to get your bearings is with a narrated tour on a double-decker bus. Your ticket is also good for an express bus that makes stops throughout the Zoo, so you can hop on and off at various points. 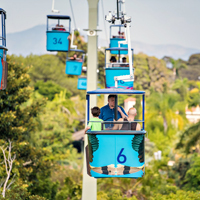 Another way to get a fantastic (and literal) overview of the Zoo is on the aerial tram. Wandering the park you’ll discover the Zoo's famous pandas, on loan from the People's Republic of China, and other top exhibits including the Polar Bear Plunge and Hippo Beach (both enclosures offer underwater vantage points); the Monkey Trails exhibit, home to many endangered species; and the Elephant Odyssey, where you can view current species while exploring prehistoric fossil evidence and extinction causes; and Koalafornia, featuring the largest collection of cuddly eucalyptus-eaters outside of Australia. For youngsters, the Children's Zoo with its petting corral of friendly animals is a fun interactive experience. The Zoo is open daily with extended hours during the summer. Adjacent to the Zoo is Balboa Park, one of San Diego's most beloved treasures. Known as the "Smithsonian of the West," Balboa Park is the largest cultural park in America and features 17 museums and performing arts venues as well as beautiful gardens, the lily pond and botanic building, concerts and a host of special events. Take a stroll down the main El Prado promenade, enjoy the gorgeous 1915 Spanish Colonial-revival style architecture, and grab a bite to eat and one of the many purveyors in the park. From Balboa Park, it's an easy drive to La Jolla, the "Jewel of San Diego." With a dramatic coastline boasting incredible views and wide sweeping beaches, La Jolla is consistently voted on of the most popular beach destinations in California. Spend the afternoon in the water learning to surf, or kayaking, snorkeling, riding a stand-up paddle-board or just playing in the waves. Or if you're more interested in sightseeing, visit the seal colony at Scripps Park, spend a few hours at Birch Aquarium at Scripps Institute of Oceanography, or take an ocean-view hike at Torrey Pines State Park. Be sure to keep an eye out for migrating whales off the coast as they travel to and from Baja, California. La Jolla is also an excellent place to shop for souvenirs and enjoy lunch with offerings from casual to fine dining. After an afternoon of sun and sea, explore the vibrancy of San Diego's Downtown. Depending on your interests, you can shop, stroll, dine, or dance into the night. Horton Plaza Shopping Center, a multi-story, open-air mall, is known for its eclectic architecture, people-watching opportunities, and more than 100 stores and shops. Make a purchase here and you'll get three free hours of parking—ample time for shopping and exploring the surrounding Gaslamp Quarter. Home to art galleries, boutiques, coffeehouses, neighborhood bars, swanky nightclubs and restaurants of every stripe, the Gaslamp Quarter is San Diego nightlife central and offers something for every budget. Dining ranges from family-style restaurants and upscale steakhouses to Italian trattorias, tapas bars, Asian eateries and more. Several clubs and restaurants host live music (the House of Blues has a venue here), while others feature DJs, televised sports or simply the buzz of lively conversations. Movie theaters include the Gaslamp Stadium 15 and the UA Horton Plaza, and if it's baseball season, you can catch a Padre game at the spectacular Petco Park.